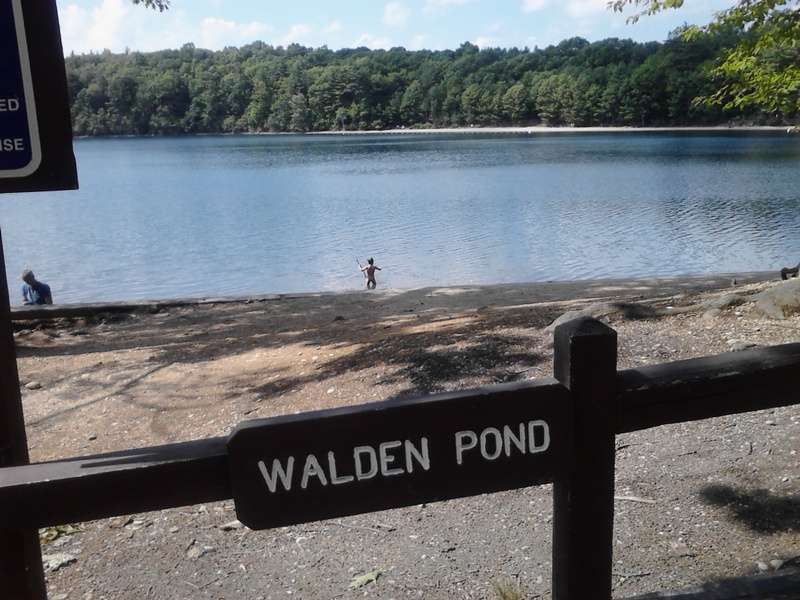 My friends, the Zagwyns, are in Massachusetts this summer so they sent me photos of some Transcendentalist landmarks, including Walden Pond. They knew I’d love to see and hear all about this amazing spiritual vortex. This is the birthplace of the Transcendentalist movement and New Thought followed closely behind. I like to think of us as the New Transcendentalists. If you attend a Center for Spiritual Living Center or follow New Thought some other way, your lineage includes a group of distinguished American thinkers called Transcendentalists. Ralph Waldo Emerson, Henry David Thoreau, Margaret Fuller, Bronson Alcott and Walt Whitman are among them. You have a very proud heritage. The early New Thought writers all quoted Emerson and for many, many years, he was the best known, most quoted and most widely read of all American authors. For example, my mother could quote Emerson poems by heart. It is difficult for us to imagine how much impact Emerson had because his ideas are all around us today and they don’t seem that original. However, he was a revolutionary influence in the fields of philosophy, religion, and literature. His ideas about finding God in Nature, self-reliance and trusting ourselves branded the character of this nation as democratic and self-reliant. Emerson was trained as a Congregational minister but he did not believe in some of the rituals, including communion. He decided to become a writer and platform speaker instead. In 1836, he published an essay called Nature. It was not particularly well received but now it is a standard reading in college English classes. The same year Nature was published, Emerson helped establish an informal group popularly called the Transcendentalists. This group originally gathered to discuss new ideas from Europe; instead, they became the birthplace of independent American thinking. The Transcendentalists were important founders of abolition, women’s suffrage, and authentic American literature as well as opening up traditional religious thinking. Emerson was the central figure in the movement. During the next fifty years, Emerson wrote and spoke all over the nation and in parts of Europe. His essays included Self–Reliance, Compensation, Spiritual Laws and the Over Soul. Our CSL class on Emerson includes these and other essays as well as some history of the era. So many of the ideas and attitudes that we think of as distinctly American come from the works of Emerson and the Transcendentalists. It is hard to imagine a world without them. It is also extremely difficult to imagine Religious Science without Transcendentalism. Ernest Holmes was born 1902 and died 1956. He was a self-educated thinker who combined Emerson’s idealism with mental healing techniques. The 1937 Science of Mind Textbook is one of the most influential books of the 20th century. The two men lived in entirely different worlds, even though they were New Englanders, because of the differences in life at their different times. Despite these material differences, Emerson and Holmes had much in common. Both were born into families with dominant mothers and absent fathers. Both had brothers, but no sisters. Both men were precocious, avid readers and showed amazing promise at an early age. Emerson entered Harvard at 14. Holmes dropped out of school because he was bored and studied independently. Both were born in New England. Emerson lived his whole life around Boston – most of it in Concord, and that was the vortex of intellectual power in his time. His neighbors and friends were some of the most brilliant people in US history. Margaret Fuller, Bronson Alcott, Herman Melville, Nathaniel Hawthorne, Theodore Parker and in New York City, Walt Whitman were all his good friends. Holmes chose to move to the creative center of his time – Los Angeles. His congregation was filled with movie stars, and one of his main financial contributors was the man who subdivided Bel Aire. The Institute he established included Asian religious leaders, college professors and psychologists. Holmes’s open mind blew away any narrow idea of religion. The teaching was called Religious Science because he viewed life as a whole, with no split between science and religion or the visible and invisible worlds. Both men were generous. During Emerson’s lifetime, he supported his mother, brothers, friends, including the Alcott family for most of their life. He also very generously sponsored the publication of other writers works. Stories about generosity abound about Holmes’s as well. They both lived well and neither was interested in amassing a lot of money. They expected it to be there. Emerson and Holmes shared many beliefs. They both believed in idealism – that is they believed that behind every material experience, there was a spiritual cause. They believed in abundance – that is they could share their wealth, give of themselves, circulate freely and there would be enough to go around. They believed in self-reliance, that is, that the final authority in our lives is within, that we must look within to find our unique and individualized truth. They believed in the sacredness of life – all life. Neither man distinguished good and bad aspects of life, but they saw only good. They were both fascinated by Asian religions and incorporated compassion and detachment into in their teaching. Nevertheless, they remained Westerners. They believed in the innate value of all people. They recognized that all of us have a divine origin and nature. This is your lineage. If you have studied Ernest Holmes, you have also studied Ralph Waldo Emerson. Their wisdom is available to you as a gift from the Universe. Say thank you and accept; happiness, peace, idealism, optimism, self-reliance, sacred life, and all the other components of their enlightenment. What would I like to accept from Holmes or Emerson? What would more self-reliance feel like? What would more self-love feel like? What would _____ feel like? Great article! I was transported back to our Emerson class ~ what a fascinating time in history. We all had great fun with that class. I loved watching my old tapes when I was younger and fatter. Life moves on in good and not-so-good ways, I guess. Thank you for this. It’s a wonderful piece. I’ve forwarded it on to some new friends who are not yet attending Religious Science churches but are interested. This is so clear! You’ve made me want to pull out Emerson’s Essays and read them again. I’ve always loved them and loved teaching the class as well. Thanks for the kind words. You are a great promoter of wisdom and I appreciate it. Thank you Jane for the wonderful description of two like minds that have so changed our lives. Wonderful article. Thank you for each and everyone of your articles. I particularly like this one because it gives me a sense of heritage and belonging. I really enjoyed this article…it was grounding and gave me a sense of being part of a movement that is inherently curious and forward thinking. Plus I was totally impressed with your quote “For example, my mother could quote Emerson poems by heart.” IMPRESSIVE!